Front Row (left to right):+Ann Hotta (Graduate Theological Union), Jacqueline Lapsley (Princeton Theological Seminary), Elaine Robinson (Brite Divinity School), *Virginia Todd Holeman (Asbury Theological Seminary), *Lucinda Huffaker (Wabash Center). Second Row: *Robert Pazmiño (Andover Newton Theological School), Susan McArver (Luther Theological Southern Seminary), Linda Strozdas (Catholic Theological Union), Melody Knowles (McCormick Theological Seminary), Fernando Cascante (Union – PSCE). 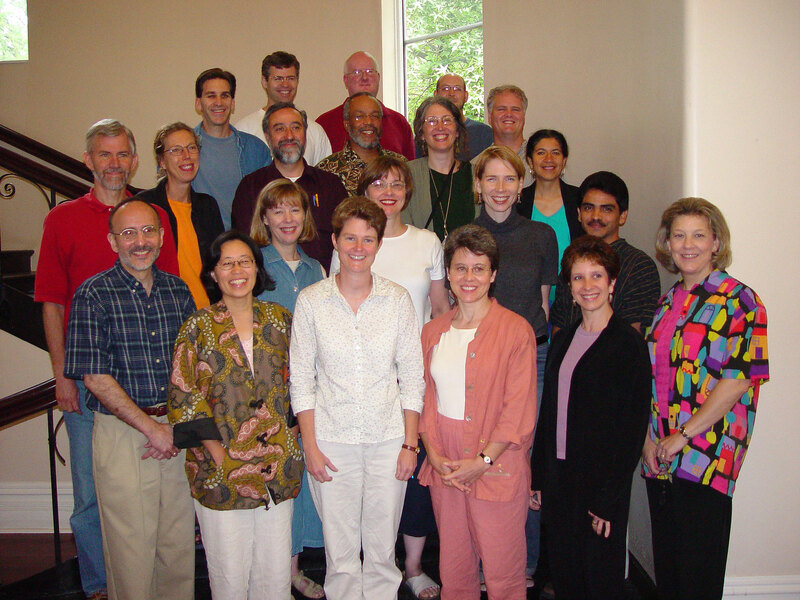 Third Row: *Theodore Hiebert (McCormick Theological Seminary), Susan Pangerl (Meadville Lombard Theological School), Mariano Avila (Calvin Theological Seminary), Howard Wiley (Payne Theological Seminary), *Elizabeth Bounds (Candler School of Theology), Elizabeth Conde-Frazier (Claremont School of Theology). Fourth Row: Stephen Ellingson (Pacific Lutheran Theological Seminary), Dave Lose (Luther Seminary), Shaun Casey (Wesley Theological Seminary), Clifton Guthrie (Bangor Theological Seminary), *Thomas Pearson (Wabash Center). Not Pictured: Carolyn Sharp (Yale Divinity School). Teaching Biblical Interpretation to Hispanics using Distance Education. Combines on-site teaching and tutorial help via the Internet. Goal: develop and implement effective methodologies that will equip adult learners in their own place and language — a significant service to churches and faith communities in the country. My project has a twofold goal: an assessment of my own evaluation practices since I became a full-time professor at Union-PSCE, and the development of an effective integrated framework (theoretical and practical) of academic assessment of students for the courses I teach. My project assesses the pedagogy of the National Capital Semester for Seminarians, a Washington based semester for students from seminaries and divinity schools to study theology and public policy. The second part of the project assesses the interest in this subject by interviewing faculty and academic officers from representative institutions. Transformative Learning for Becoming Disciples and Citizens in a Multicultural Society explores: learning that helps us engage diverse ways of making meaning and understanding the world; how this process transforms our prejudices, attitudes and approaches to the “different other”; what pedagogical strategies achieve transformational learning in theological schools. My project examines the role of the social sciences in theological education. Its goal is to identify strategies that integrate the social sciences with core disciplines of theological education and develop classroom practices that will help ministry students cultivate a sociological imagination. Good children’s books, particularly picture books, are like sermons in that they rely on oral performance, patterned language, and surprise to achieve their effect. I will explore what preachers can learn about making their craft more effective for a wider number of people by paying attention to good children’s literature. My project will focus on refining a seminary course on women in the Israelite/Judean cult, with a teaching focus on integrating archaeological objects and web-based resources into the classroom. Reading Scripture as a Habit of Mind: Develop a course on the diverse ways sin and salvation are understood in the Old Testament, paying particular attention to how students might best develop a habit of mind that integrates the richness of Scripture into the daily practice of ministry. I seek to identify teaching strategies that rely on greater peer engagement to maximize student learning. My intent is to use and evaluate several strategies in online and face-to-face versions of a basic preaching course and to revise both classes in light of my findings. The Past as Present: Involving Students in Historical Research seeks to connect the lives and ministries of students with the history of religious cultures and individuals through direct work in historical archives, utilizing primary source material. Development of an archives project as the major assignment in two history courses. Develop a fifteen-module sequence for an online pastoral care course. Benefits of this format include: a more geographically dispersed and diverse audience, active inclusion of cross-modal learning and perceptual styles, practical use of technology in delivery of pastoral care, and utilization of the expertise of religious leaders who are geographically distant. Pedagogical Strategies for Contemporary Christian Theology: a revision of the basic course in systematic theology. It will focus on a methodological framework suitable to the contemporary setting, the development of varied evaluative criteria and pedagogical techniques, and the incorporation of instructional technology that will enhance student learning. Hermeneutics and Authority: Reading Isaiah in Community: explores the intersection of text-focused hermeneutical issues in Isaiah with negotiations of the authority of readers and communities in reading and reinterpretation processes. A study of Isaiah framed within a multivocal, decentered classroom and pedagogy that affirms multiple learner competencies, passions, and learning styles. Goals: Utilize pedagogical research and colleagues’ wisdom to 1) critique and develop two previously-taught courses, attentive to alternative course designs, syllabi, methodology, interactive assessment tools, and Web materials that address a variety of adult learning styles in pastoral care; 2) hone lecture, discussion and technology skills; 3) enjoy the process. My project seeks to develop teaching strategies that are guided by an understanding of the Spirituals as a pedagogical gateway through which newly emerging African-American theologies can enter into theological conversation with African-American congregations. The project will also explore creative ways to use the Spirituals to mediate theological construction.